Experience the beauty of Cinque Terre from the water on a sunset cruise departing from Levanto. Watch for dolphins darting through the sea, and cool off with a refreshing swim and snorkel break. 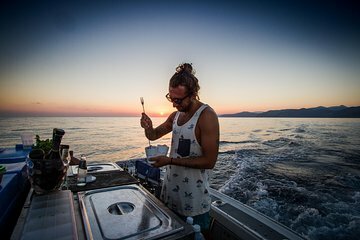 As the sun heads toward the horizon, sip unlimited wine and cocktails mixed by a professional bartender and enjoy a light grilled dinner on board. Stay out in the water past dark to see sparkling village lights come on along the coast. Meet your captain and crew at the Levanto port in the evening, and climb aboard a boat for the journey south along the famously picturesque coastline of Cinque Terre. Watch for dolphins darting beneath the surface and splashing around, and then take a dip yourself with a break for swimming and snorkeling using providing equipment. When the sky lights up with the colors of sunset, see charming fishing villages like Riomaggiore and Vernazza glowing with golden and pink hues. Toast your voyage with unlimited drinks from an open bar, including wine, soda, and handcrafted cocktails mixed by a professional bartender, accompanied by a light grilled dinner. Once the sun goes down, get a different perspective on the coastline as twinkling village lights reflect off the water. The 4-hour cruise concludes back at the Levanto port around midnight.